This is a subject for a thread that could go on forever. It occurred to me twice today... Once, thinking about our 1941 Nash Rambler... became my first car, then Norge... our first washer...Now DW asked if Moxie was still around. We have to be careful here, because old brand names are a big commodity today, with "rights" being sold to the highest bidder, and revivals coming from third world countries as well as US major competitors. So toss out an old brand name, and we'll "fact check" to see if it's still in use. 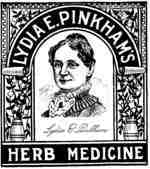 Lydia Pinkham's Vegetable Tonic was a popular remedy for "female complaints" and the elixer was promised to cure every womanly ailment from menstrual discomfort to infertility to the dreaded prolapses uteri. Advertisements claimed there was "a baby in every bottle," and women of the time, uncomfortable discussing feminine problems with male doctors, turned to Lydia. Many were scandalized when, as required by the new Pure Food and Drug act, it was revealed that the tonic was 20% alcohol. Wang word processors (business, not home use). A bunch of gas station names I don't see any more (may still be a round though) Texaco? Poland Springs (1845) Duh...bottled water in the 1800s? I can see Lydia Pinkham's former home (actually quite the castle) from my living room. "Knock on any Norge"
Underwood typewriters. I learned to type keyboarding on one of those. And the name I still miss: Marshall Field's. Garanimals ( they were clothes for kids that all mixed and matched ) . I always thought they should have had them for men . Bobbi Brooks . I loved her clothes growing up . Buster Brown shoes and finally Liz Claiborne before she died and they still made decent clothes now they make crap . Was "Jarex" a national or just local product? Some sort of syrup you put in to make flavored water. How about "Jiffy Toothache Drops"? I just found some in an old storage shed. And, how "bout "Cup O Gold" candy? Do they still make it? I had my first flight on Pan am as a youngster. They served Cornish hen stuffed with wild rice. I felt very fancy and grown...Nothing like that on flights now except maybe in first class. My grandmother solved everything from a cut to a gash with Mecca Compound ointment. The brand did die, but someone retained rights and every now and then a company buys the rights and tries to manufacture and sell some of the stuff. 1st car was a Henry J, then a Kaiser, but my favorite was my Hudson Pacemaker. Its funny...now I have an "internal" pacemaker. ...Now DW asked if Moxie was still around. Yes, it is. You can buy it at the grocery in Maine. Don't know about anywhere else. Texaco was bought and merged into Chevron Corporation in 2001 but continues as a marketing brand name.